The Lancaster pistol was a 2 or 4 barrelled handgun produced in England in the late 19th century. Based on the patents granted to Henry AA Thorn and Charles W Lancaster, the pistols were manufactured in a variety of calibres using centre fire brass cartridges and had several different grips. The model in the Museum Collection dates from around 1883. It is a .455 calibre, four barrelled example with a square grip and a ‘dolls head centre latch’ operated by a thumb lever on the side that opens the pistol for loading. During the Colonial period the Lancaster pistol, sometimes referred to as a ‘howdah pistol’¹, enjoyed popularity with British officers in India and Africa owing to its’ faster rate of fire and increased reliability over contemporary revolvers. 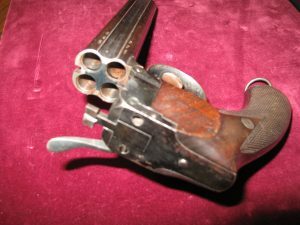 Unlike revolvers it did not leak gas when fired since there is no gap between the chamber and the barrel, and the stopping power produced by each of the .455 rounds was greater than achieved in the revolvers of the time. When facing the charging native warriors the heavy lead bullet would lodge in the body and bring the individual down rather than pass through the body with seeming little effect as often happened with rounds from pistols of that time. Sometimes depicted as a British alternative to the revolver, firing multiple shots from separate barrels, the pistols worked on the basis of simplicity and could cope with almost any condition without the risk of jamming or suffering particularly from wear and tear. They were not given a conventional form of rifling; instead the bore of the barrel was made with a slight twist to the bullet. It was a simple and effective way to retain the advantages of rifling whilst eliminating the problem of conventional rifling grooves becoming blocked by black powder fouling. Lancaster pistols had a break-barrel design, supported by a hinge underneath the barrels at the point at which they joined the frame allowing them to be reloaded with the brass cartridges much like a revolver. The firing mechanism was unusual featuring a rotating grooved cylinder (located inside the frame) that the firing pin followed to strike the cartridges in each barrel in turn. The Lancaster would remain popular in India and the African colonies until revolvers and semi-automatic pistols became more reliable and were often preferred by British Officers until the First World War². ¹The howdah pistol was a large-calibre handgun, often with two or four barrels, used in India and Africa during the period of the British Colonial rule. The term “howdah pistol” comes from howdah, a large platform mounted on the back of an elephant. Hunters, especially during the period of the British Raj in India, used howdahs as a platform for hunting and needed large calibre side arms for protection from attacks by wild animals. The first breech-loading howdah pistols were little more than sawn-off rifles; later English firearms makers manufactured specially-designed howdah pistols in both rifle calibres and more conventional handgun calibres such as .455 Webley and .476 Enfield. As a result, the term ” howdah pistol” is often applied to a number of English multi-barrelled handguns such as the Lancaster pistol.